We have two super-creative neighbors, who happen to be sister and brother. Sister Marissa is a jewelry designer who sells her beautiful wares in a shop around the corner from our apartment. (Every mom within a three-block radius of State Street seems to be sporting Marissa’s beautiful initial pendants; to me, they’re the modern version of those boy/girl shapes our own mothers used to sport). And brother David recently transformed a creaky, tumble-down storefront on Atlantic Avenue into a beautiful wood-hewn tribute to the best in no-fuss but gorgeous, solidly made, durable menswear (In fact, the stuff is perfect for the way my husband shops; unlike me, he spends a lot on one piece then proceeds to wear it (out) every day – so it had better be made to last). But Goose Barnacle isn’t just a clothes shop, it’s also a place for David to show off pieces of art that match his hand-crafted aesthetic. 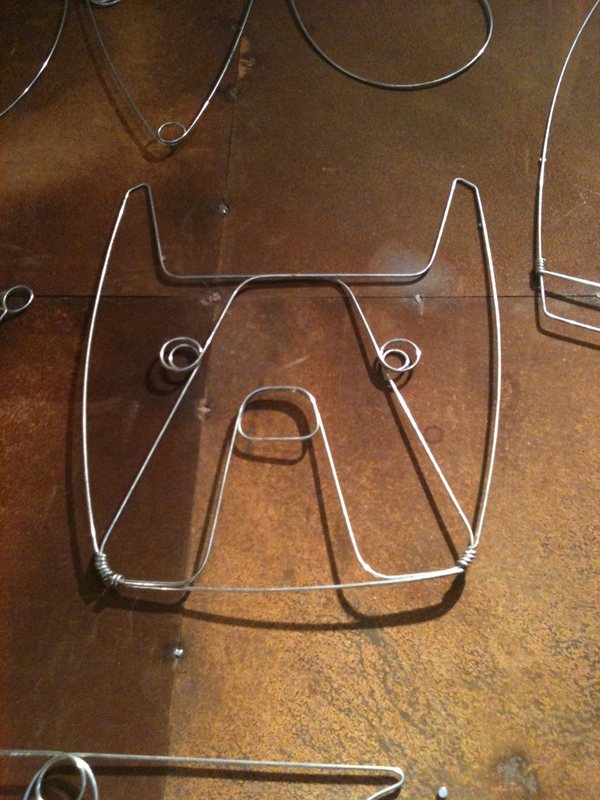 I was reminded of his wire display while browsing one of my other favorite shops in New York (this time, near work). If you’re not familiar with Mxyplyzyk, you should be. Of course, there are more of these MOMA-store-inspired tchotchke shops popping up all over the place, but Mxyplyzyk (look it up) was an originator of the scene. And it’s one of those design-centric shops that seems to always keep its inventory new and fresh, no matter how often you visit (it’s been there for as long as I can remember). For those of you who are slightly bored by the Wallcandy-Blik-decal overload of the past few years, but don’t have a lot of space to feature big posters or the patience for wallpaper, these fabulous metal dogs are full of personality and only $65 each. It’s funny to find something so similar to something you walk by every day, so I thought I’d try and learn a bit more about David’s colleague and collaborator for Goose Barnacle. Turns out this guy is a pretty big deal! His name is Rodger Stevens and his work has been featured all over the place -from private residences of the rich and famous to some really gorgeous retail locations around the US. 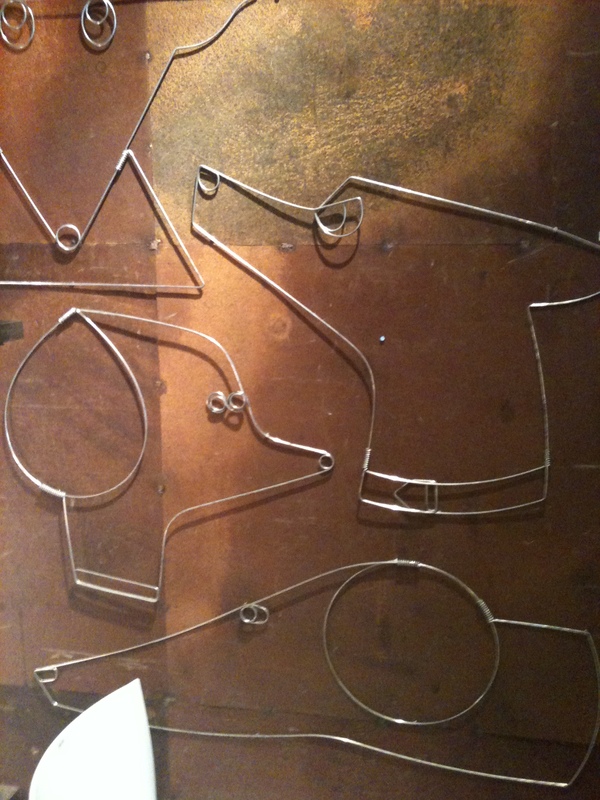 He calls his work “shadow-casting metal narrative pieces” – to me, that’s one fascinating thing about this work. 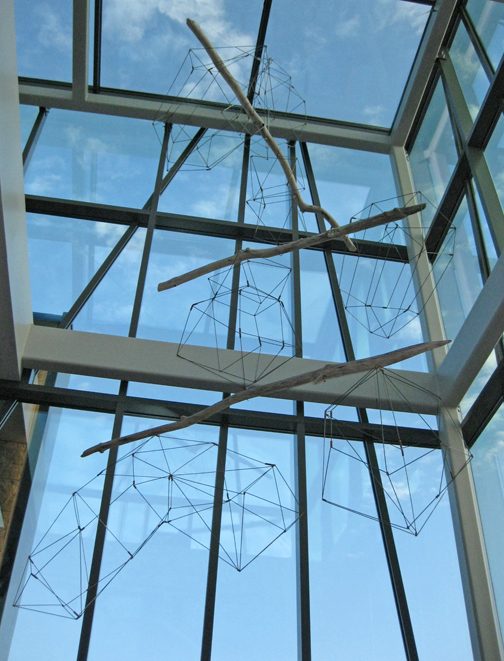 Whether mounted against a wall, hanging from a ceiling, or standing on its own, these thin sculptures end up occupying more territory and feeling ‘fuller’ than you think they would at first glace. Here’s a video of his technique, courtesy of David’s website on behalf of Stevens. Untitled from Goose Barnacle on Vimeo. Which takes me back to the dogs. I bet they’re probably imitations of his work (an impression based solely on price point) but if it builds an appreciation for three-dimensional sculpture and the place it can have in a kids’ room, to me, that’s pretty cool. Check out more about Rodger Stevens here. Could be a nice option if you’re looking for some new art in the rest of your home too. Throw me in an antiques showroom and you’ll find me immediately gravitating towards (and salivating over) a few key pieces. One would be a Paul McCobb wall-divider. Another, a Hans Wegner Papa Bear chair (featured prominently on Apartment Therapy). But the most iconic to me, and the most emblematic of its time, would probably be a piece of Broyhill Brasilia furniture. Introduced at the Seattle World’s Fair in 1962, the line was created to evoke and celebrate the architecture of Brazil’s new capital, having itself been created during a four-year period in the late 1950’s. When viewed from above, the city’s shape resembles a plane or bird, which is mimicked on much of Broyhill’s original fabric and tiles. What stands out most about the architecture is the use of hyperboloid structures, as in the cathedral and it’s parabolic columns, which are said to represent two hands moving upwards towards heaven. What’s so interesting to me is how, fifty years later, these pieces seem to have captured the popular imagination among people my age, and that they’ve started showing up in nurseries and kids rooms across America. 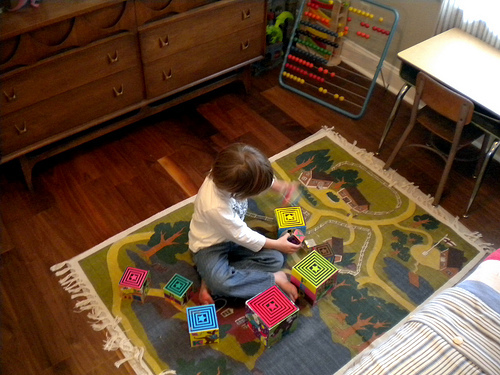 One: An awesome woman and cool mom named Candice has taken photos of her son’s amazing room, and posted them on her blog, Ragamuffin Design. 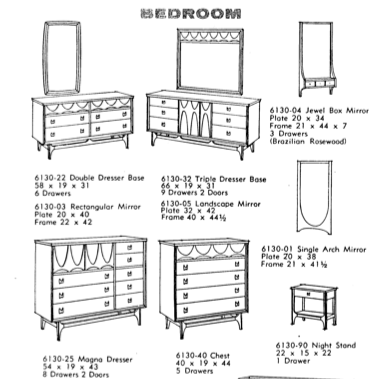 Here’s a shot of the double dresser, but please check out the entire room – it rocks. 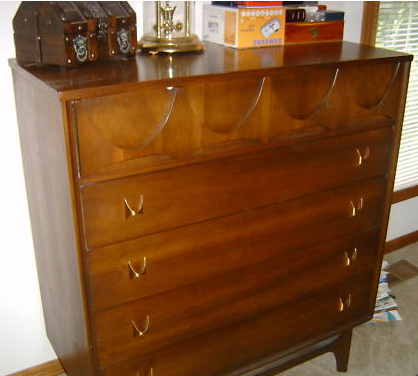 Two: A member of the “Vintage Delight” group (part of the CasaSugar site), named Carolyn has written a post about having refinished a double dresser for her daughter’s nursery. 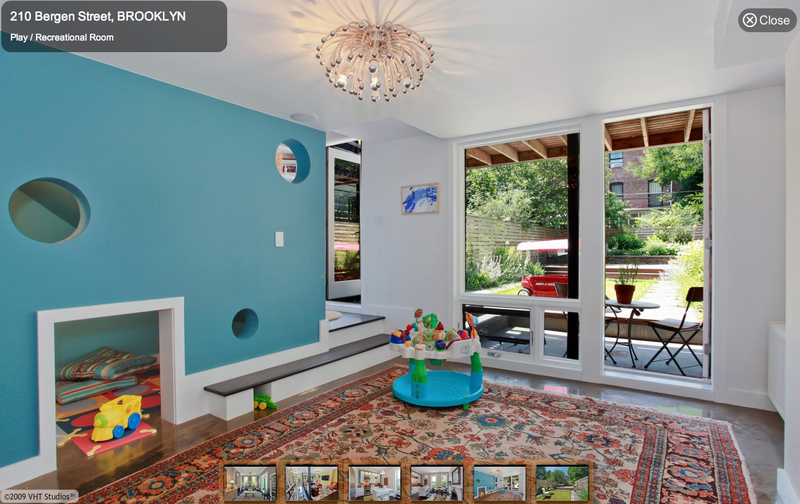 As you can see, it’s the same piece as in Candice’s house, with a very different feel. Of course, doing something like this to an original BB piece is akin to blasphemy to many collectors out there (I gasped the first time I saw this photo). But, hell, to each his own, right? It certainly ‘fits’ the nursery space very well, and as Carolyn mentions, her entire house is full of Brasilia. There are tons of stories online of folks who bought their BB for a song at a tag sale. In fact, knowing that this is the stuff my parents grew up with, I’m sure they’ve noticed, shrugged, and passed by pieces like this time again over the years while scouring for vintage furniture. So I’m sure you’ve got a shot there. 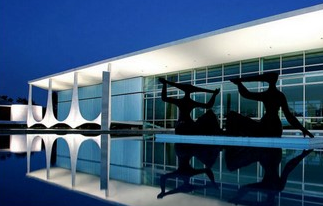 But if you’re of the want-it-now variety, there’s always the Brasilia Collection folks and, of course, there’s Ebay. As of today (7/19) you can get a great dresser for a song. . . if you live near Munroe Falls, OH (or are willing to incur shipping costs from there). LoisLois123 is selling this beauty for $300. 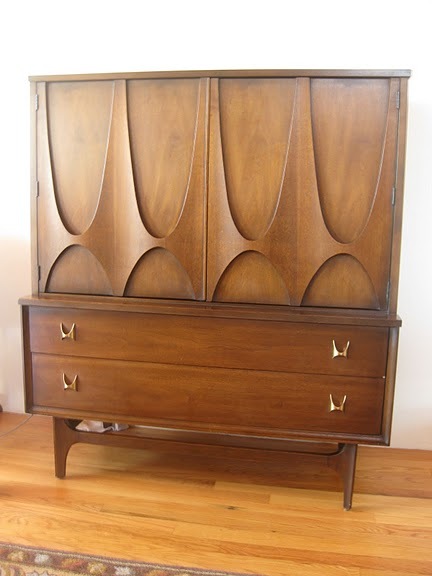 The matching double dresser (like the ones featured above) is $325. 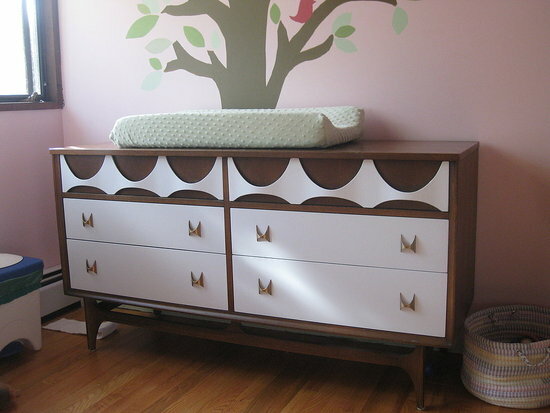 So for the price of an Oeuf crib, you’ve got yourself two vintage dressers and tons of storage. I’m jealous already. When architects are challenged with redesigning interior spaces, they’re often expected to make maximum use of the square footage on offer. 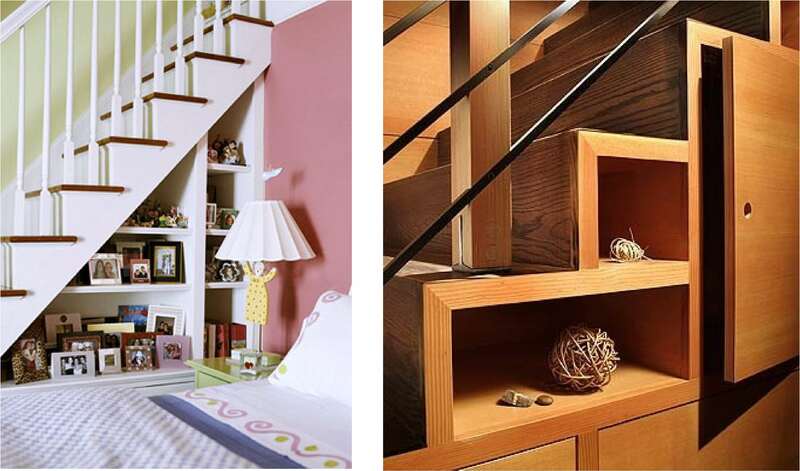 I’m not an expert in any way, but based on my primary experiences in space planning class, what to do with stairs (and the resulting negative space underneath) has got to rank as one of the toughest tasks on hand … especially when the home is small to begin with. Anyway, back to the room. 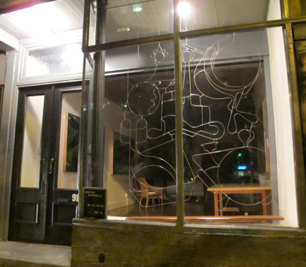 As you can see in the sketch (above), the playroom occupies a space that’s below-ground on one side and adjacent to the outside space on the other. An amazing firm called Coburn Architecture (located here in Downtown Brooklyn) had the fantastic idea to section off the space below the staircase; then, instead of walling it closed, they created a little cubbyhole/clubhouse for kids to play in. Then they added small round cutouts as much for visual effect as to showcase the spaces behind the walls. I love how the photo is staged with cushions to show how the area might be used. No matter, really, when it’s my fantasy house. But back in the real world, I’m very impressed with Coburn’s work (as featured on their website). They’re a multidisciplinary office, offering both architecture and design – and some of these designs are to die for. 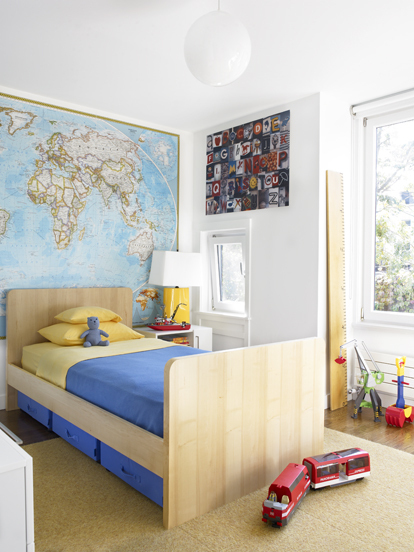 Here’s what I believe to be a boy’s bedroom in the architect’s own home – simple, clean, and well-apportioned. Great work.